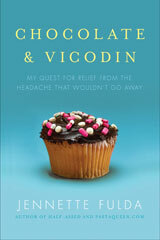 The good folks at Migraine.com have posted a tasty little excerpt of my last book, CHOCOLATE & VICODIN, on their site. Read more here. Earlier: Look what I found in the trash! 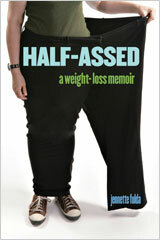 I am reading Half Assed again, and it’s as good as the first time I read it. You rock! @Robin Jankiewicz – Glad you’re enjoying it! I’ve read both of your books, loved them both. You actually have shared two experiences of mine, or I with you. I’ve lost 84 lbs. with diet and walking, and I too suffer from a headache. It was constant for almost 10 years. Thanks to your book “Chocolate & Vicodin”, I suffer less. They had me on topamax to stop me from getting headaches. What a crock. It is the stupid drug. I thought it was me going through perimenopause and then menopause. Nobody could answer me when I said I had no retention span. Duh! Thank you from the bottom, top and middle of my heart. I’m off it now and feeling better. My headache has disapeared for days at a time. It’s much better than having it forever. I just tell myself when It does come up, “put yourself back in your box.” I works most of the time. I still resort to a migraine med. once in awhile, but I feel much better. @Jo-Ann – Thanks for stopping by! I’m glad to hear you’ve enjoyed my books and that they’ve helped you in some way. Here’s to better health! Just started reading Chocolate & Vicodin I’m laughing through my pain. I’ve been off work for almost a year now with my headaches and some of the passages were like reliving what has and is happening to me. I described the same scene from Alien to my Doctor. I laughed so hard. I hope your headaches are better or getting better. Thank you for sharing your experience it makes me know I’m not alone. @Tamee – Sorry to hear about your headache, but I’m glad to hear you enjoyed my book. My headache has been pretty good lately, staying in the low-barely-noticeable range mostly.